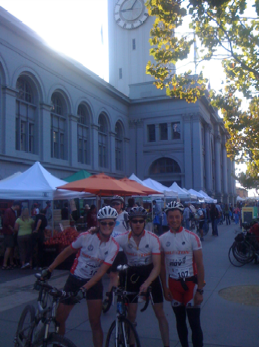 Team AR Navigation Supplies/Ground Floor Media Wins Overall at the 2009 San Francisco Oyster Urban Adventure Race. Things had been very quiet for the team after the Big Blue 24 hour race. Andy was injured and wasn’t allowed to race so we were on hold waiting for his recovery. I was dropping Andy off at his house one evening after hanging out and as he was getting out of the car he asked what I was doing for the coming weekend. I had nothing planned so Andy said his friend Stephen from Colorado was looking for a teammate for the weekends San Francisco Oyster Urban Adventure Race. I knew a little about the race as Andy and his friends had won the event for the past 3 years. I said I might be interested in racing so Andy said he would pass my contact information to Stephen. The next day I received a call from Stephen and we discussed the race and what was involved. During the discussion he happened to mention that the team needed a girl to race with too as Kathy was also injured! I made a couple of calls and posted on the BAAR Yahoo Group and the next day Angel Garbarino replied to the post so I recruited her onto the team immediately. I’d seen Angel race and I knew she was a super strong athlete and would be great for the team. We arranged to meet for dinner the evening before the event so as we would have at least met before the start on Saturday. 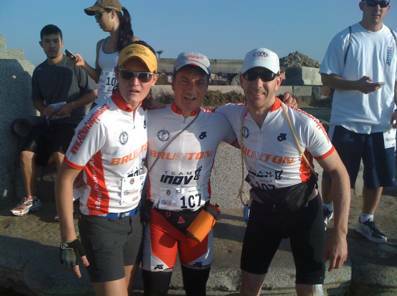 Stephen reviewed the 2008 event with us and gave us all the details on the tasks involved and the format of the race. It sounded very entertaining with beer tasting and other challenges that would tax the brain as well as the body. The start was at the Sports Basement in the Presidio so I decided to ride there on Saturday morning with all my gear in a big INOV-8 backpack. I ran into Stephen just as we were riding through the Arguello Gate and we rode down the hill together. Kathy would be our super supporter for the day and was already there. Angel was also there early and had found a spot in the transition area that was promptly moved to a spot that was nearer the TA exit. I was looking around watching people rack $10,000 full carbon TT bikes as well as a bunch of beach cruisers. I was thinking that doing an Urban AR in San Francisco was going to be a mistake on a $10,000 Cevelo P4. I was looking for our main rivals and then I saw Gordon Wright with his team and the Dirty Avocados with Jenn from BAARBD.org. Now it was getting to be interesting, these guys know how to race and were looking more serious than the triathletes that had shown up. We set up our gear and made sure all our phones had each others numbers programmed in. This event was high tech for an adventure race. We were allowed GPS units and smartphones to help find our way around the City. Kathy would be stationed in the TA and would help answer the clues to the checkpoints that we would have to find. After a short pre race briefing the teams were told to send their best navigator to the buses that were parked at the back of the transition area. As the designated navigator I was chosen to go on the bus. I made sure I had my phone and followed the crowd. I was standing next to Adam Dotti of the Dirty Avocados team and we started strategizing about where they could be taking us. As we got on the bus they gave each of us a large bag to put over our heads and cover our eyes. I guessed Guantánamo Bay in an orange jumpsuit. We were told we would be taken to some secret location, which made Adam and I laugh. We’d both lived and raced in the City for many years and couldn’t think of any place they could take us that we wouldn’t immediately recognize as soon as we took the hoods off. So we were all sitting on the bus with bags on our heads and the thought suddenly occurred to me that with a bag on my head I couldn’t tell if Adam had actually put the bag over his head too or if he was cheating. So I reached across to check that his face was covered and immediately poked him in the left eye through the bag. There was a bunch of muffled cursing coming from inside the bag and a voice complaining about being poked in the eye. I told him I was sorry, I hadn’t meant to put our closest competition out of action even before the event had started. The bus started moving and I started counting the turns that we took the direction that we were going. Adam said we were probably going to Aquatic Park as we were heading East through the Marina. We turned left off Lombard Street at Van Ness and stopped a few hundred yards later. When we removed the bags from our heads, sure enough we were at Aquatic Park. Everyone filed off the bus and waited for the first instruction. There was a mob scene as the first instruction was handed out and people rushed off to read where they had to go. 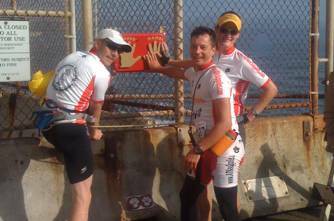 The first instruction said that we needed to meet our teammates at a location called the Wave Organ. I’d seen this on a map of the City during the week before, its located on the outside harbor wall of the San Francisco Yacht Club. I immediately started running over Fort Mason and followed about 10 people who had started a few seconds ahead of me. I started to call my teammates on the phone but no one was answering. I called a bunch of times and even stopped to make sure I was dialing the right number but still no answer!! I called Kathy at the TA frantic that we would be losing time and she told me Stephen and Angel were already on their way to the Wave Organ. I was running hard and making up time on the teams that had got their clue sheet before me and I figured we were in the top ten somewhere. I met Stephen and Angel at the top of the steps. We had to have our picture taken with all 3 of us in the photo. Stephen had given our camera to someone from another team who offered to take the picture for us. She took the picture and handed the camera back to Stephen while asking if we would take a picture of her team who had just arrived. Stephen grabbed the camera and apologized as we ran off. I looked back as we ran away and she looked pissed off. Oh well. That’s racing. We needed to return to the TA and get our next instruction. I hadn’t managed to recover from the sprint to the Wave Organ when we were off at full speed. Stephen threw me a towrope and I settled in behind him while navigating the shortest path through Crissy Field back to Sporty B’s. The next instruction said we had to go to the Ferry Building where we would need to buy produce at the farmers market. The name of each piece of produce had to start with the one of the following letters. O-Y-S-T-E-R.
We were very fast in transition. Angel showed the efficient equipment changes that I’d seen her do in other races and we were ready to go in less than 2 minutes. We exited the TA and seemed to be the first team on the road heading to the Embarcadero and looking back there didn’t seem to be anyone behind us. Could we have taken the lead in the TA? This is when Stephen told us that he’d left his phone in the TA. Luckily I still had mine so we would be able to take the picture we needed to complete the task. We arrived at the Ferry Building as the first team after flying down Bay Street. Stephen and I were trying to find the items at the market while Angel watched the bikes and coordinated what we bought. We picked up an Orange, Yellow Squash, Strawberry, Tomato, Extra Virgin Olive Oil and Roasted Cashews. The people at the market didn’t seem to know what was happening as we were paying for stuff and not worrying about the change. I gave up $2 for a single strawberry and a tomato and I didn’t even get to eat them. In fact I have no idea what happened to them after we got back to the TA. All we needed now was to get our photo taken with the Ferry Building in the background and we’d be good to go. I though about the poor people at the market who were about to be mobbed by 297 crazy racers trying to buy produce that spelt O Y S T E R. They had no idea what was coming down on them. I’m just glad we were first there and that they thought it was a novelty having 3 spandex clad people overpay for fruit and ask to have their picture taken. Can’t image they be so patient or accommodating in about half an hour as the P4 Cevelo crowd showed up. We rode back to the TA and were the first team to check in. We received the next clue and were told to run to the beach and turn left where we would find someone. We were also given an inflatable pool mattress to carry with us. It was obvious someone was going to get wet. We found the CP and were told that one of the team had to swim out to a kayak that was 30 yards out into the Bay. Angel and I immediately voted that this was going to be Stephen. It was his race and only fair that he would be the one who took the glory and got wet. We didn’t even bother inflating the mattress. Stephen stripped down to his shorts, stuck the mattress between his legs for buoyancy and started swimming. He reached the kayak, grabbed the pass card and swam back to shore. I started reading the next clue while Stephen put all his gear back on. We needed to go to the climbing gym near the warming hut where we would get the next CP. We arrived at the gym and I was designated to be the climber. After signing the waiver I threw on the harness and stepped up to the wall. Another team had come in right behind us and now it was a race to the top. I started out behind but took the lead half way up the wall. My few times at the gym with Andy had paid off. At the top of the wall was a bell that we had to ring and inside the bell was a clue. It said Hoppers Hands. I came back down and told the others the clue. Angel knew where this was. It was at Fort Point, just under the Golden Gate Bridge. We called Kathy to confirm and started running. Kathy confirmed that we needed to be at Fort Point. We still had the lead but other teams were close. We found a tourist to take our picture at the Hoppers Hands and told her that she needed to get out of the area to avoid being mobbed by the other crazy racers that were on their way. Want to know what Hoppers Hands are? We now needed to go back to the TA again and get the next clue. We were running back through the race traffic and could see some strong teams were not far behind us, but everyone else was miles back. As we passed the beach we could see that the staff had moved the kayak in so it was now only about 20 feet from the shore. You could probably walk out to it without having to swim. Some of the later teams must have complained or they were just trying to handicap the leaders by making us swim further. Back at the TA we received our next clue and had to get on our bikes for a trip to the Castro. We needed to find the concrete slides and a plaque for some historic landmark. We found the plaque first. It was cemented into the sidewalk on Castro Street. 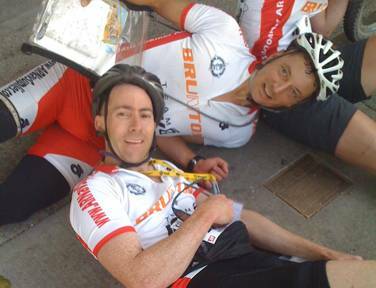 We had to lay down and have a passer by take our picture which was no problem. We made our way a few blocks West to the concrete slides and luckily enough they were deserted, we had the place to ourselves as we took a picture of Stephen and I sliding down. We found out later that some crazy local started screaming at the racers. Apparently she called the police who were forced to give tickets as you were only allowed to be in the park if you were accompanied by a child. One couple received a $45 ticket for being on the slides without a child present. I hear the race organizers paid it for them. We hadn’t seen another team in a while and rode back to the TA through the crazy Saturday AM traffic. I had Angel on tow as we weaved up Divisadero and cut across to Presidio Boulevard. We had taken a very efficient route avoiding the steepest hills and were still in the lead but we had no idea by how much. Back at the TA we received the next passport and had to run to the Lyon Street stairs. This was a straight shot through the Presidio and jump over the wall onto Lyon Street. Stephen was setting a blistering pace on foot and I was fading a little so I grabbed something to eat at the bottom of the stairs. Stephen was concerned that we had another team close behind us and was pushing us to go faster. When we reached the top we found another CP where we were told to find Lovers Lane. On Lovers Lane we had to find letters marked on trees that spelt out the name of the next location we had to go to. We found a ‘B’ then a ‘W’ and I called out that we would be going to the Bowling Alley in the Presidio. Sure enough, by the time we found all the letters they spelt BOWLING. We arrived at the Presidio Bowl and were told that to pass the test we had to bowl a Strike or a Spare. As we were the first ones there we had 4 lanes to ourselves and could bowl at will. It probably took about 10 bowls between us before I bowled a strike and we were out of there on our way to the TA. Back at the TA we received another clue and had to find an ad in the San Francisco weekly. The first problem was to find a copy of the San Francisco weekly. Steve suggested we go directly to the Marina Safeway where there were loads of newspaper stands outside. We found the newspaper and in the back was a classified ad that said we should go to The Pub at Ghirardelli Square. This was less than a mile away so we set off on the bikes at full sprint. When we arrived at the pub we were presented with 4 beers and had to identify each one correctly before we could leave. We failed at this twice and had to take an on the spot 5 minute penalty. While we waited, no other teams showed up and we had time to chat with the CP staff. Apparently we had quite a lead over the second place team and the 5 minutes wouldn’t be an issue. The 5 minutes were up and we rode back to the TA through the Marina. When we arrived back at the finish Angel was asking where we were going next, she didn’t believe that we’d finished and had to be called back to the finish line for the winners photo and ceremonial breaking of the tape. We’d won the coed division and the overall event in 3 hours and 20 minutes maintaining Stephens winning streak into a 4th straight year. This had been a fun and interesting event, very different to the other Adventure Races I’d done. This was closer to a TV game show than the bushwhacking slogfest of traditional AR. The team worked really well together considering that before the event we were total strangers and that can often spell disaster for adventure racing. As always I’m looking forward to the next event in the Big Blue series. 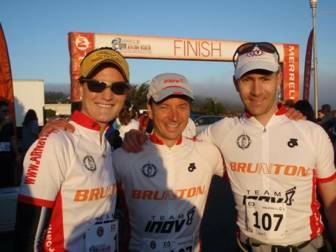 Thanks to Brunton, INOV-8, Ritchey, Magura, BooCoo Gear and Ellsworth for providing AR Nav Supplies with the very best gear for Adventure Racing.